I feel sick to my stomach. It's been a lousy week. First the digital camera is stolen, now this. The worst. We found Godzilla tonight in the neighbor's yard, pretty much where Lum died and Claws was attacked, another casualty. The fifth cat we've lost to the dogs our neighbors rescued from being euthanized. 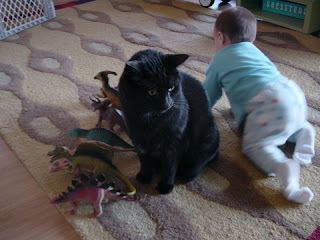 Godzilla was pretty much the best cat you could ever have. We found him as a tiny stray kitten six years ago and he lived up to his name. He weighed about 16 lbs, all muscle. As he got older, he grew white hairs in his armpit and pubic area. He was such a character. Lately, he'd taken to hanging out in Jasper's room. 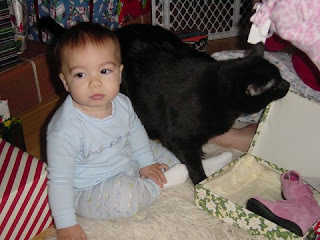 He wouldn't even leave the changing table if Jasper had a dirty diaper, he would let the baby lay on him and purr. He used to do the same thing when Roo was little. He loved the kids. Godzilla was the kind of cat who came when you called his name, which is how I knew something was wrong today when he didn't respond. Our cats are part of the family. This is perhaps even truer for 'Zilla. We miss him so much already. So, uhm, keep your cats indoors? You're a very irresponsible pet owner. Losing 5 cats to the neighbors dogs is not the cats fault OR the dogs fault. Sure, the first one could have been a mistake but the next 4? Your fault. ...and this comes from an animal lover.